Morning! I've got a slight case of the Monday Blues today. It always seems to happen after a fun wedding weekend. You all know what I'm talking about, right? You have such a great time starting Friday night and all the way to Sunday, but then slowly realize you have to go back to reality on Monday. The wedding was of our good friends, Jeff and Bonnie, and was held at the Annapolis Yacht Club. The yacht club is right in downtown Annapolis and has almost 360 degree views of water. It was a beautiful venue and the weather could not have been better. Rain and clouds disappeared just hours before the wedding, making way for a beautiful day of celebration on the water. We were even able to hang out on the dock during the reception and get some great views of the amazing yachts docked right there. With all of the sailing paraphernalia around us, I was inspired to create this board. 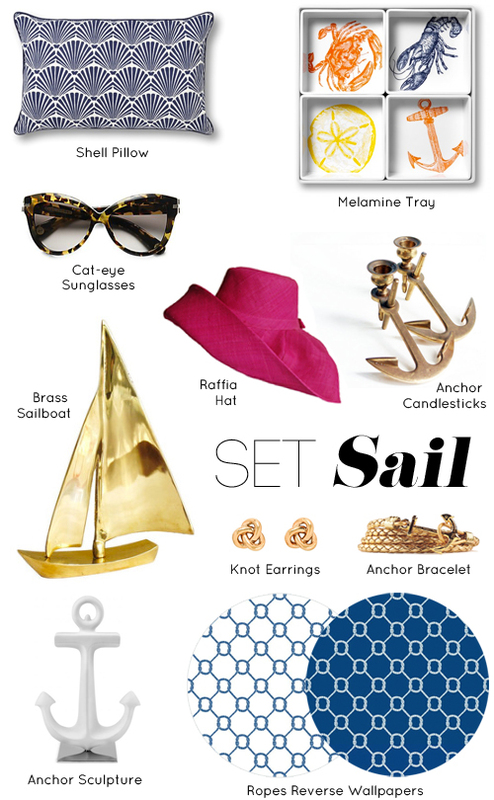 Ohh ya know, just a few things I'd want to take on/use to outfit my fabulous yacht (if I had one) for a day of sailing. Wouldn't you agree? Annapolis is an awesome place! Such a sweet vibe. Those cat eye shades might just be my next "sunnies" investment!